For years now, Electronic Arts and Steven Spielberg were supposed to have been working on a project called "LMNO". We'd long thought it was dead. Now EA has finally confirmed it. Jake Kazdal, a former EA developer who worked on the game, told the 8-4 podcast "I don't know exactly what was the thing that made it fall apart. I'm sure anybody you ask is gonna tell you something a little bit different, but it didn't end up ever taking off." "There was some rival game stuff that may or may not have come out of EA that was basically the same thing minus some of the stuff we were doing. There was just a lot of politics." 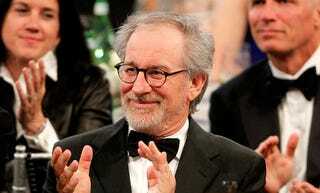 Electronic Arts then confirmed the game's shutdown to Joystiq, though stressed that the mega-publisher "maintains its relationship with Steven Spielberg". Maybe they just felt the partnership was better served making a game based on one of Spielberg's less exploited film properties. Empire of the Sun 2: Death March, perhaps. Or Batteries Still Not Included.